How can professionals in the banking and finance sector assure stakeholders, convince consumers and appease regulators? The surprising solution rests with creative and engaging presentations. We bring you three ways to harness stunning visuals to your advantage. Challenges and change from every direction at break-neck speeds—if you’re in the banking and finance industry, you’re probably facing this challenge every single day. There’s pressure from stakeholders who want sizable returns, consumers who want more value and regulators who demand increased levels of compliance. Often, you have the answers to put all of these concerns to rest. The difficulty lies in communicating data-heavy information in an appealing way. So, in a traditionally logical and analytical sector, is it time to get creative? 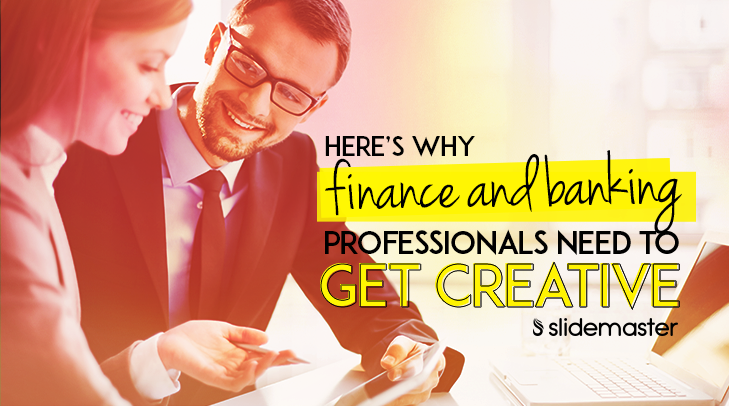 Surprisingly, research* shows that 67 percent of companies that displayed creativity outperformed their peers on financial metrics. It turns out, finding a creative way to showcase solutions and results could be your unexpected secret weapon to success. Stakeholders look to you to build trust in their investment. So, it’s vital that you engage them by strengthening their confidence in your financial performance. Begin by revamping boring charts. Win your audience over with eye-catching infographics that display the relationship between business performance, results and ROI. These days, consumers are spoilt for choice. With increasing competition from FinTech companies that are shaking up the industry, you need to make your value proposition crystal clear. So, grab consumer attention. Highlight how you deliver not just a service, but something truly valuable. Explainer videos are a great way to take viewers through facts and details in a short and easy-to-digest format. Shifts in regulation are a massive part of the financial industry and compliance is a must. Demonstrating compliance matters not just for assuring regulators, but also for building a reliable and reputable brand. Validate your credibility with show-stopping presentations. Back your messages with an engaging, professionally-designed PowerPoint deck. Then deliver it with passion and energy. An expert coach can polish your storytelling and presentation skills, and help you to put your audience at ease. When faced with a barrage of challenges, don’t be afraid to get creative. Analytical, persuasive and appealing need not be mutually exclusive if you stick to our three tips. Let us take your factual content and turn it into a knockout presentation. Contact Slidemaster today for a free 30-minute consultation. Our three pillars of content, design and delivery means we nail the elements of presentations that convince, compel and engage. Marketers, can you afford not to nail your next boardroom presentation?